Mexico is a fighting country. Its veins carry in them the blood of Aztecs, the blood of the Aztec Triple Alliance of Tenochtitlán, Tlacopan and Texcoco, renowned for their tenacity and resilience in battle. Mexico has also produced countless boxing world champions: Oscar De La Hoya, Carlos Zárate Serna, Pablo César Cano, Antonio Margarito—I could build a seemingly endless list here. Boxing is Mexico’s second most popular sport after soccer. It surpasses, to the surprise of some, baseball. Mexico’s first world champion, José “Battling Shaw” Pérez Flores was crowned as such in 1933. Mexico also is famous for its lucha libre, its masks and traditions being ingrained into the Mexican collective popular memory. Mexico is also a country with an incredibly rich and textured history of social movements and revolution. It’s the country that saw men like Emiliano Zapata, Marcos, Pablo Villa—three of Mexico’s most iconic revolutionaries—fight for the rights of their people. Jesús Malverde—the Angel of the Poor or the Narco-Saint—is a patron saint, a sort of national symbol of the struggle of the poor against the rich. The proverbial fight is as Mexican as Mexico itself. There are currently thousands of people marching in Mexico, protesting the kidnapping and murder of 43 students in the state of Guerrero, in a case that ties local drug cartels with corrupt politicians, bringing to life the Mexican people's worst nightmares of criminals and those who are supposed to lead and protect the population being so intertwined that they're almost impossible to tell apart. It is a harrowing situation. Human rights watchdogs set the death count of Mexican people at the hands of the drug cartels at 60,000 since 2006, it is a bleak hour in Mexico's history. The country needs a jolt of positivity. Perhaps this Saturday's showcase of Mexican talent can divert even a slightest part of the stress toward the joy of crowning Mexico's newest national sports heroes. Like I said before, Mexico's fight of choice is boxing. Mixed martial arts haven’t yet reached critical mass: for this warrior nation, although the sport of mixed martial arts is increasing its reach and capturing the nation’s imagination, representation in mixed martial arts is brought on mostly by American fighters of Mexican descent. That is until now, when Mexico takes the UFC spotlight for the first time, presenting a card full of national promise, at the highest elevation ever, a condition only true warriors can withstand. All eyes are on Mexico this weekend, and the country will show the world its first step in giving the world the first Mexican mixed martial arts champion. Saturday’s card features a handful of “true” Mexican fighters, most of them coming from TUF Latin America and populating the preliminary card. These fighters are Yair Rodriguez, Alejandro Perez, Jose Alberto Quiñonez, Gabriel Benitez, Marco Beltran, Enrique Briones and Augusto Montaño—the latter of which is being touted as Mexico’s champion-in-the-making. Kelvin Gastelum and Ricardo Lamas also share Mexican heritage with these fighters. The Ultimate Fighter: Latin America’s focus on a Latin American audience helped the sport explode in the public eye—with Fabricio Werdum and Cain Velásquez at the helm, guiding a group of highly talented and exciting UFC prospects. Now, throughout the country mixed martial arts academies are sprouting like desert flowers after a deluge. But it’s still too soon to tell just how pervasive this explosion has been. Still, UFC 180’s most important fights are taking place between non-Mexicans, since Mexican-American Cain Velásquez was replaced by the Kiwi Mark Hunt after injuring his knee and Erik “Goyito” Pérez also had to pull out because of injury. Fabricio Werdum, although Brazilian, is incredibly popular in Mexico, largely in part to the fact that he communicates with mixed martial arts fans in Mexico in Spanish. He’s spent a lot of time in Mexico, learning its culture and traditions and reaching out to the folks who look up to him. 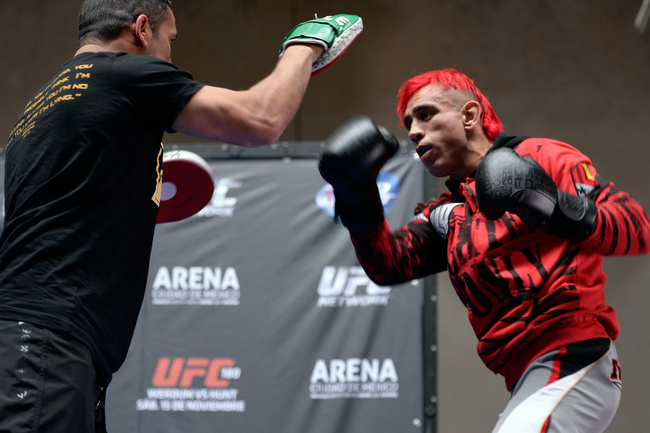 Just yesterday he stole the show during UFC 180’s open workouts. In front of some 300 hands, the Brazilian heavyweight took to the microphone, and thanked everyone who came out, that after two months of non-stop training in Mexico, he feels Mexican, and he’ll be representing Latin America on Saturday. To sweeten things up even more, Werdum will be walking out to what is possibly Mexico’s most beloved and traditional song, “Cielito Lindo.” He asked the fans to join him in song during his speech, and the Mexican public obliged. In an interview after the event, Werdum went on to express his sadness for not being able to face Velásquez in Mexico, who, although American, goes the distance to represent Mexico in the sport. He also said that when he is enchanted with how much affection the people in Mexico have blanketed him in, that when he is with the Mexican people, he feels good. He plans on returning the favor. That kind of inclusive interaction goes a long way with the public there—it invites the fans in, makes them feel part of something bigger. With this in mind, for mixed martial arts to grow in Mexico, it will be important for them to have a champion that is their own. Mexico needs its own, Mexican Werdum. Brazil arguably invented mixed martial arts at the onset of the last century, and the US and Japan have had two decades planting and nurturing the sport of mixed martial arts in their respective cultures. One of Mexico’s premier and earliest fighting teams, the Bonebreakers, is only 10 years old, and because of a lack of support, a lot of fighters just move to the United States in order to accomplish that dream of stepping into the Ultimate Fighting Championship’s Octagon. In order to strengthen themselves and protect their teams from an up-to-now inevitable fighter diaspora, Mexican academies are coming together, consolidating their assets. An evening of Mexican wins on Saturday could make Mexican mixed martial arts fans’ wildest dreams come true. More cards there could allow Mexico more national heroes that transcend even their greatest boxing legends. Mixed martial arts are, after all, still exponentially growing and have eclipsed boxing. A successful Saturday night for Mexicans in UFC 180 could mean more support for fighters to get the training they need—the raw talent is there. Mexico, currently sort of finds itself in the same place Brazil did a few years ago. Like the US, Brazil now has the infrastructure it needs to harness its raw talent to a polished final product. But that wasn’t the case before 2009. Some would argue that Brazil’s mixed martial arts explosion didn’t come until 2011, when Anderson Silva knocked Vitor Belfort out in Las Vegas—two Brazilians fighting each other for the world championship. Mexico claims its next champion is Augusto “Dodger” Montaño, who will face Chris Heatherly in a welterweight bout. Beyond that, Mexico has more bullets in the clip with which to show everyone why it shouldn’t be lagging behind the United States, or even Brazil for that matter. They’ve got what it takes—a warrior spirit, raw talent, fans who will cherish and support them—now it’s just a waiting game to see if they can deliver a booming performance to echo into eternity, and give focus to another rising mixed martial arts empire like the Irish did earlier this year.